iPad Impressive battery life on 4th gen iPad. Discussion in 'iPad' started by Booloo, Nov 23, 2012. Coming from an iPad 2 and 3, I must say I am very impressed with this iPads battery life. This is only the second full charge since I had the device. Main use from this charge is web browsing, you tube, and the new Rayman game. 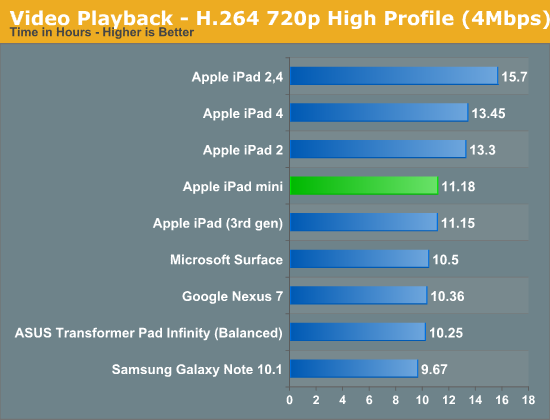 I don't have any exact numbers to compare it to the iPad 3, but the difference seems significant. Wow, that's amazing battery life! I look forward to getting my first iPad this Christmas. BTW, what does standby time mean? Does this time include the 15 hours of usage? Standby just means the time it was not being charged but lock screened and not being used. So 7 days off a charger, 15 hours use, 18% battery. I've gotten 18 hours so far. Trying to see if I can make it closer to 20. 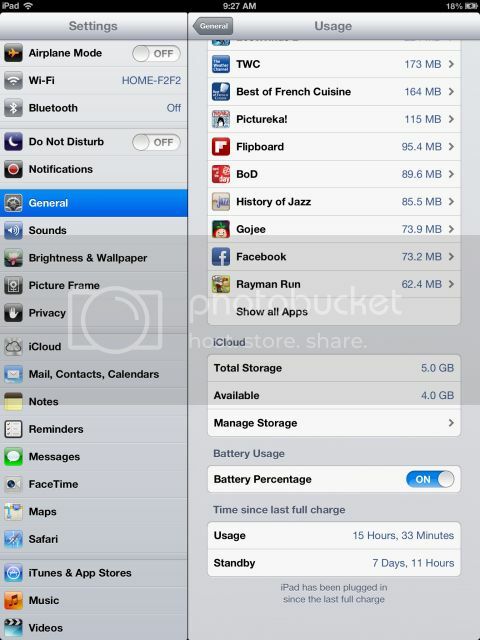 Good to know as on my ipad 2 it get 10-11 usage and around 17-18 hours standby. Is that newer or older version of the ipad 2? 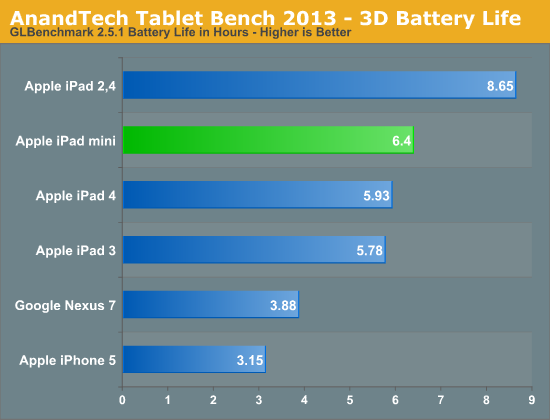 The newer iPad 2 has improved battery life and slightly faster. I've read it has close 2 hours or so more battery. More efficient processor. I should see a huge improvement when I get the 4 soon then. Yes, you should in my case I get 18 hours by keeping the brightness at 25% (auto brightness off), notifications off, email on manual, no Bluetooth or GPS. I usually have multiple apps and browser tabs running. Thats with everything on auto brightness, notifications, email etc. I use it for Internet mainly. Yup, looks about right. I am getting 15-22 hours of use from mine. My iPad has been running for 23hrs and 58 mins and I still have 42% left. Do you guys always keep your ipad on then? like you do with your iphone or do you turn it off when you aren't using it? im gettin anywhere from 14-18hrs of usage with pretty heavy game play. standby ends up around 2days. amazing battery. my iPad 4 LTE battery life has increased ~ 1 hr over my iPad 3 LTE. while this may not seem like much, that's usage. standby i've noticed it's even longer. i'm glad that apple allowed me to return my iPad 3 even though i was outside of my 1 week return period, the upgrade to the iPad 4 was worth it. when i know i won't be using it a lot, i close all of the apps then close the case so it turns off the screen. it uses such a small amount of power in standby that the savings from turning it off for a couple of hours is negligible. Turn off Wi-Fi (no internet lol). Surfed, played some games, watched Bloomberg live for 2 hrs. My battery life on my iPad2. Two exchange accounts running, words with friends, web surfing, reading some books, a little bit of you tube, ESPN Football app, and streaming the news some, using the VPN daily and using remote desktop and some random stuff. I find these 18+ hrs claims hard to believe. Are you running at min brightness with zero connectivity? Playing MP3s with the screen off? Screen is at half brightness, with auto brightness turned off and no on the music. I've have always had great battery life on my iPad 2. I mostly use this for fantasy football, I VPN into work with it every morning to check on a couple servers and I read and check email. 7 days standby or 2 days, the usage is still in the same ballpark. And yes I average 2-3 hours of usage a day. I guess that's little use to some, for me I'd think that's average. Don't have time to play on my iPad all day unfortunately. I believe it. If its not a normal run down test I'd say the battery drain isn't as bad with normal use. I have brightness around 35-40%. Usage for me would be about 60% safari, 15% games, 25% apps. If they are benchmarking at 13+ hours for video playback, why is it hard to believe 18+ hours for normal things like checking email, browsing the web, etc? 20 hours seems to be the norm for me, mostly web browsing and reading magazines. half brightness, etc.